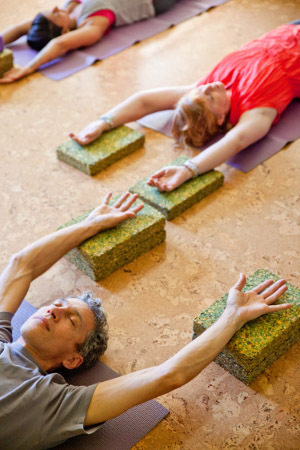 In Yoga Therapy classes with YTI, you can work privately one-on-one or in small groups. Talk to Maggie about what option might be best for your situation. Therapeutic Yoga small group classes are mainly focussed on minor aches and pains of the body-mind continuum. Levels are mixed. The approach is gentle, but the outcome is powerful and transformative. Maggie will help you find your edge between not too hard and not too soft, differing for each individual. Props will be used when needed. Expect to be cared for individually, yet challenged to find what is best for you each day you come. You will not only experience asana (postures) but the other limbs of Patanjali's classical 8-limbed system of Yoga, including deep breathing and meditation. Chanting, visualization, and gestures are used to enhance the therapeutic, healing experience. Private Yoga Therapy is the traditional way this practice is taught in Chennai, India. Maggie spends a minimum of 3 sessions with you, exploring your whole body-mind-breath system. Each session is one hour. We collaboratively establish practice goals and then start moving through them with a practice created just for you to do at home every day. This self-healing, self-regulating practice creates the causes and conditions for healing to naturally arise through relaxing the mind, lengthening the breath, and gently stretching and strengthening the body. These classes are delivered at the Inner City Ashram in East Vancouver. Maggie is excited to be starting a new class called the Chennai Practice, modelled after the Mysore Practice of Astanga Vinyasa Yoga (Pattabhi Jois). This class is for private students only. Private Students will come to the Inner City Ashram once a week, for 6 weeks minimum, to do their own practice along with others doing the same, while Maggie circulates and offers feedback. This will motive private students to keep practicing at home for the rest of the week. Please see attached and fill out before coming to private or public classes.